I’d read about, and seen pictures of, a large boulder out in the backcountry, near the base of Queen Mountain and decided I wanted to find it. You’re probably thinking, “You’re nuts. 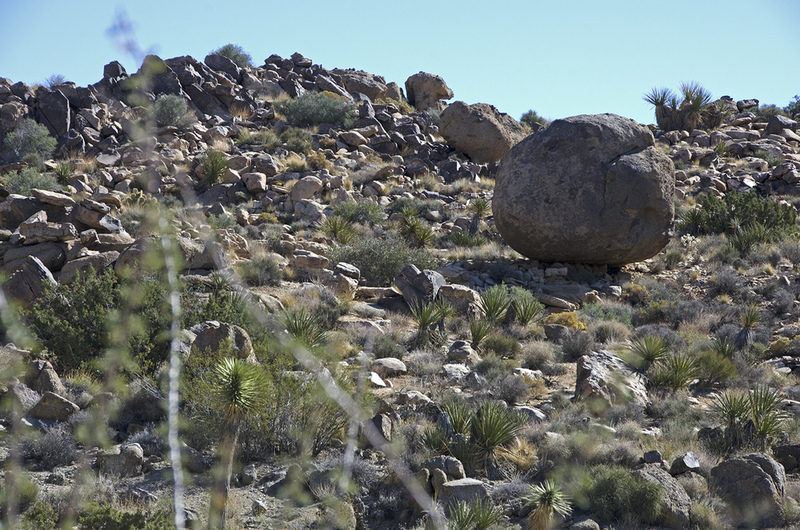 There are hundreds, if not thousands of large boulders in Queen Valley. And one looks much the same as another, so what’s the big deal?” That’s a fair question. But that still left a lot of ground to cover and approximately 14,587 rocks to inspect. Thankfully, I found a source that provided me with gps coordinates for the boulder I was looking for, which turned a rather daunting search into a great walk in the park. 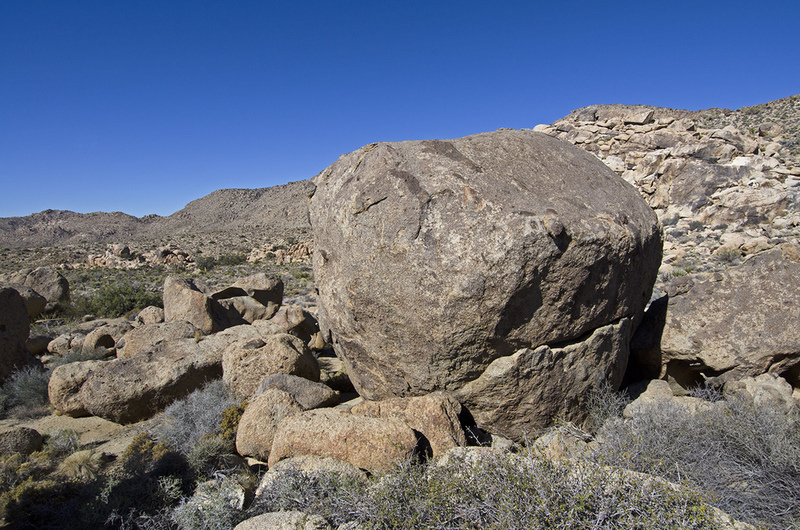 There’s no direct trail to the Pictograph Boulder, it’s pretty much just cross-desert hiking. I parked at a small parking area at the end of O’Dell Road, which is also the starting point for hiking the trail to Queen Mountain and the Underground. After waymarking the parking lot, Murbachi and I gathered up our gear and started hiking east. 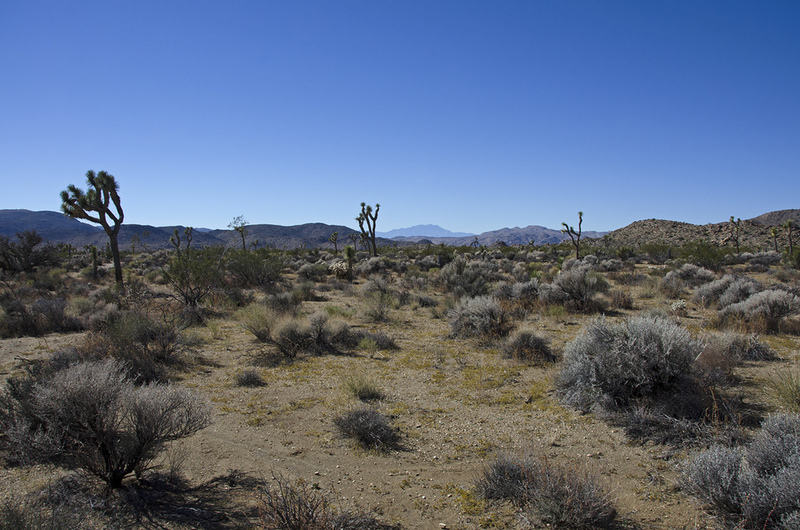 The terrain is fairly level and our path occasionally followed small washes. 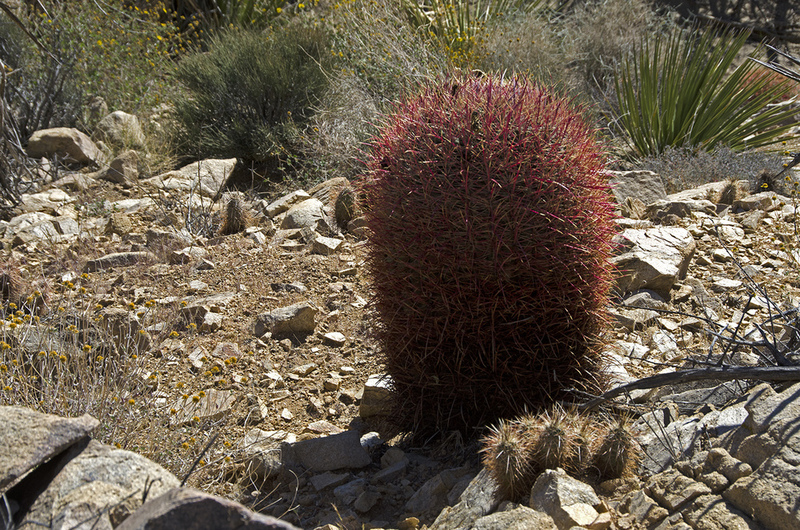 The only slight difficulty throughout the day was avoiding the various cacti and yucca barbs that always seem to thirst for blood. The weather had cooperated once again and provided us with temperatures in the low 70s and a clear blue sky. It was a perfect day for exploring. After hiking about ½-mile, we approached the first of several rock piles we would encounter that morning. Skirting around its north side, the next rocky area was about ¼ mile ahead and we were still right on track according to the gps. In fact, there was a very large boulder up ahead that I thought could be the one we were looking for. Alas, it was not. We continued hiking. And then, up ahead, there was another large boulder that I was sure would be the one. But it wasn’t and we continued hiking. There are some really interesting rocks in the area we hiked through and it would have been easy to spend several hours exploring them, especially if we had been searching every rocky overhang and hollowed out boulder looking for the Pictograph Boulder. As it was, we easily added an extra hour or more to the trip taking pictures and wandering about. We passed by several spots where quartz veins poked up through the desert ground and splashed the surrounding area with hundreds of shards of white quartz that gleamed in the sun. And then, we were there. 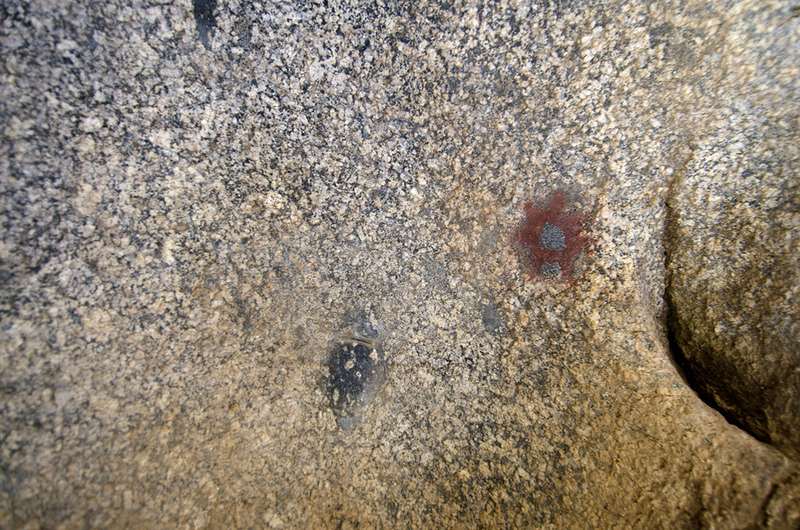 The Pictograph Boulder is big and one side has the familiar scooped out concavity that you see in so many monzogranite rocks at J Tree. 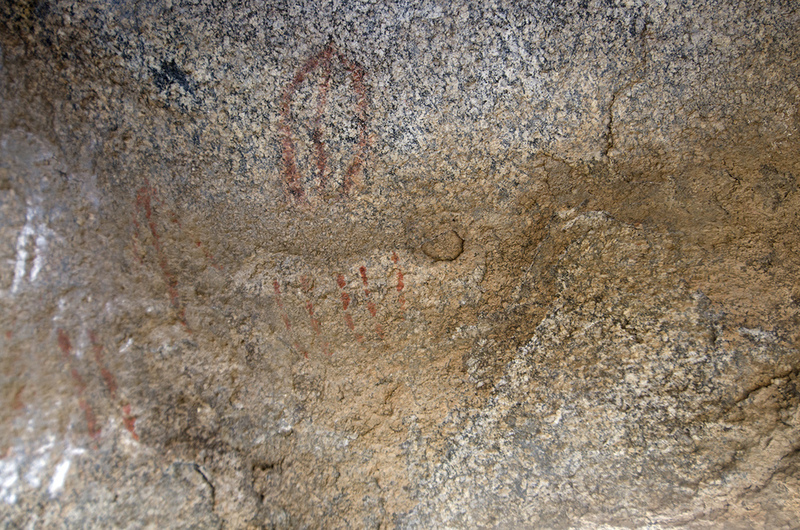 Walking into the mini shelter, I looked up and saw the pictographs. There are quite a few and most are very faded. 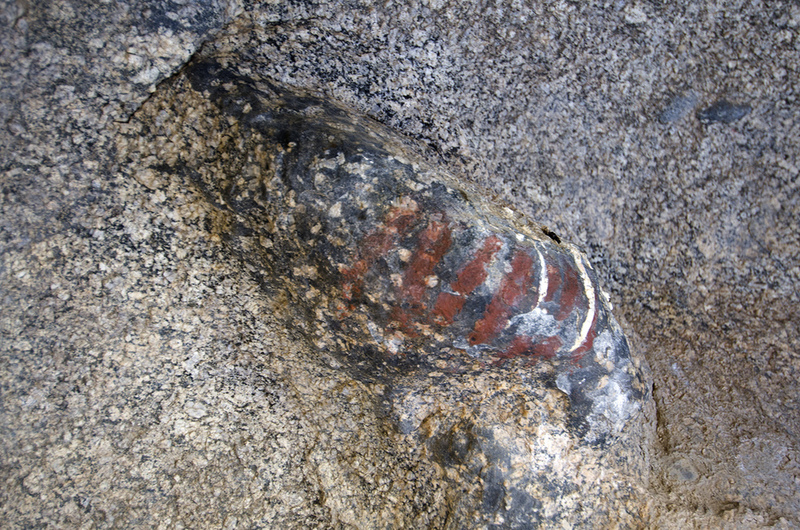 A couple interesting ones were painted on small rocks that extruded from the surface of the main boulder. One looked to me like a ladybug. There are a number of straight lines and other shapes. A sun burst was still very plain, as was an arrow that pointed up. The hike to the boulder is only about a mile, but it’s so quiet and peaceful, it seems to be even more remote than it is. It’s a great setting and as I rested in the shade of the huge boulder, I couldn’t help but wonder about the Indians who spent time here and created these pictographs. I’m glad they did, as it gives me a great reason to head out into the desert to see what I can find.